I, Francesca, smell good now! Hi, it's me, Cinnamon. I've been having some "issues" at the dog park lately and it's not all Francesca's fault, really! Here I am enjoying a stick with Francesca. See how innocent we are... minding our own business? Let me tell you what's going on. There is a man that comes to the park with two dogs... an older doxie and a young rescue dog that is really weird (are there mental health clinics for dogs?). Well, we found out the young dog had problems when Francesca went up to him one day to play. He didn't react like other dogs at all. He put his tail between his legs and ran around trying to protect the doxie who didn't need any protection at all (or want any). Francesca kept trying to play with the young dog just because he was young. And that's the way he reacted time after time. In fact, the poor young dog acted like that with most dogs that approached him... scared and protective at the same time. Weird! Now we walk around with the nice couple who have a labrador retriever and a greyhound. They act like normal dogs and we like them! In fact Francesca plays a little game with the lab. She takes the dog's frisbee and plays keep away with it. Here's the greyhound having fun at the dog park. Here we are walking around with the nice people who have nice dogs. OK, so here's the next really dramatic thing that goes on. I call it the "little dog problem." You see, there is a special fenced part of the park for little dogs. Do you think their owners would take them there? Nope! When questioned, the owners say, "My little dog can handle the big dogs." Many of them are aggressive and GET IN MY FACE. I can't stand that and so I snap back and put the little dogs in their place (as it is). I really think the little dogs should go in the little dog section so I am not tempted to lay down the law! Here's a selfie I, Francesca, took at the dog park! Hi, it's me, Francesca. I have an issue to add. It's the "mean farmer issue." I run around the whole dog park with my friends minding our own business. 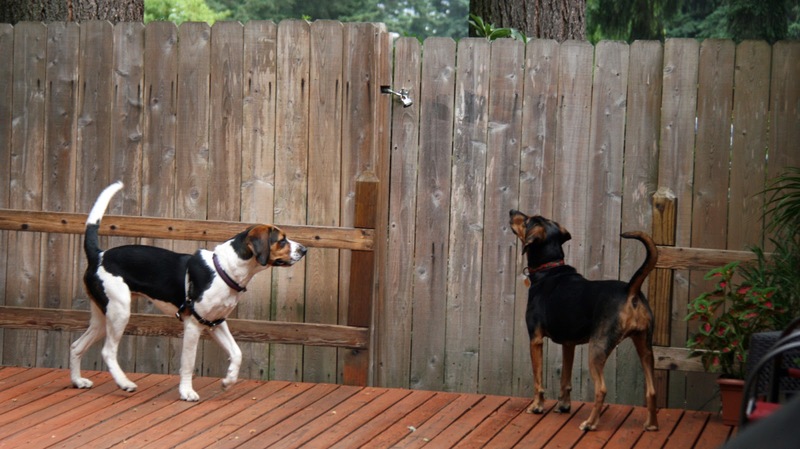 Then from out of the farm house across the street comes two dogs into their fenced yard. They bark at us and bark at us. The farmer gets so mad he yells at our owners for allowing us to get too close. MIND YOU, WE ARE STILL IN OUR DOG PARK WHEN THIS HAPPENS! I don't like some of the naughty words that are used. I, Francesca, am just a young thing and this upsets me. Cinnamon, again.... Well, you can see how exciting it is to go to the dog park. Sometimes Francesca and I have to go home early because our owner thinks part of these things are our fault. IMAGINE! I was really embarrassed when my owner posted this photo of my room. I now share it with Francesca and it serves as an office for all of us. 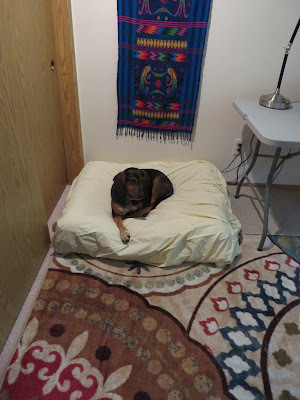 It is decorated in Guatemalan textiles (which I hate) and my owner throws towels and blankets over the carpet to keep it clean. Well, she tries! I have spent so much time training Francesca and grumbling about her presence that I haven't had time to address the issue of interior design. I was embarrassed to have everyone on Facebook see the decor in my room! So imagine my surprise when we returned from the dog park this morning. There was a huge (and very cheap) rug in the hallway all rolled up. Francesca and I had to jump over it to get anywhere. It was annoying. All of a sudden my owner took a bunch of stuff out of the room including MY BED! What was up? She even took Francesca's bed out and gave it a good shaking. (Francesca stinks!). So I walked in the room and saw..... the rug was making the room look SO MUCH BETTER! Now I am not sure I like the design but it certainly looks better than what we had before! I looked at the rug and decided the colors would look good with my black and tan coloring. I decided I liked it and plopped right down on it before she could even straighten it! I, Cinnamon, claim this rug as MINE! NOT TO BE SHARED WITH FRANCESCA! I got kicked out of the room so my owner could finish straightening it. And then my bed was placed in the correct corner and, unfortunately, Francesca's bed was placed back in her corner. I was hoping she'd get her own room so I could have the newly decorated one all to myself! This is the way it should be. Just me and my desk! So, I do approve of the new rug and I approve of taking down some of the textiles. But THEY ALL NEED TO BE REMOVED. They clash! 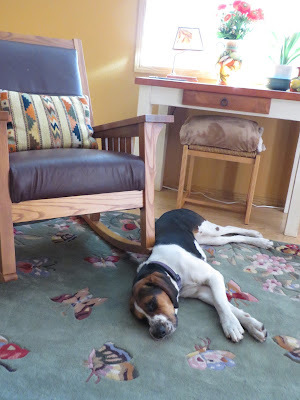 And, I think the room should be decorated in outdoor scenes and dog portraits. I'll work on that. For now, it's nap time! 1. Read the walk or hike details: Find out about the terrain, the length of the walk and consider your dog's abilities. Make sure it is a good fit. You will be expected to stay with the group. I, Francesca, limit my volkswalking to 5K walks. I know that is about as much as I want to walk. 2. Are Dogs Allowed: Check and see if your dog is allowed on the walk or hike, on the trail or in the park where you will be visiting. Volkswalks state right on the event description whether or not pets are allowed. 3. Check the weather: Heat can be deadly to dogs. Walking on city streets or paved roads increases the heat. Here is an excellent article about the dangers of hiking in the heat. And, conversely (Cinnamon taught me some big words), a walk on a rainy day might not be all that fun. 4. Bring Water: Dogs get thirsty. If it is a warm day, bringing water is especially important. There are collapsable dog bowls and water bottles with attached bowls that you can carry for your dog. Amazon carries a variety of them. 5. 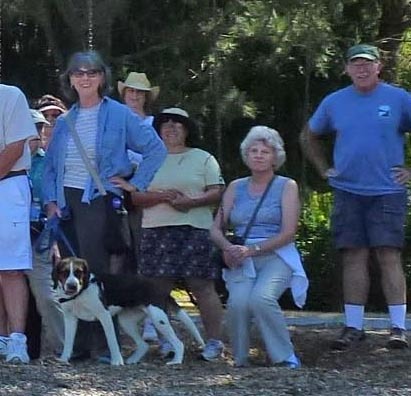 Leashes: Even if your dog is good about coming back to you on command, a leash is important when you are walking with a group. It is important that the dog not interfere with others who are walking or get overly friendly with another dog on the walk or hike. Good leash manners are important. 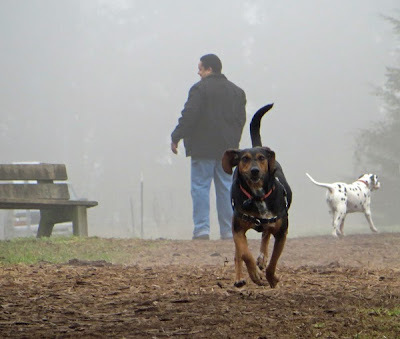 It is especially important that the leash not trip someone who is walking or hiking with you. If your dog goes from one side of the trail to the other, you might want to walk last so that you don't trip someone! 6. Other Dogs: If there are other dogs on the walk or hike, space them so they don't interfere with the group by playing, pulling toward each other or, heaven forbid, fighting! Talk to the other dog owners so you can work these things out. 7. Clean Up: It goes without saying that owners need to carry bags and pick up after their dogs. Usually that will be listed on the rules for the trail. 8. Registration Courtesy: When I was new to volkswalking, I trotted right up to the registration table and then saw a loose dog. I pulled and barked my head off. Lesson learned. Dogs should stay in the car while the owner registers for an event. But be mindful of heat... not in a hot or warm car. 9. Treats: I, Francesca, think this is a really good idea. Often people stop on the trail and enjoy a snack and so dogs should too. I think being rewarded for good behavior makes walking and hiking even more fun. 10. Backpacks: Dogs need to be tested and trained to wear a backpack. It should be the right size for their weight and height. If a dog can wear a backpack on a hike or walk, you can fill the pockets with water, treats and bags. Test out your dog's tolerance for a backpack at home before trying to use it in a group walk. If it doesn't work out, YOU, the owner may be carrying everything! You can buy dog backpacks on Amazon.com. Editor's Note: Of course I, Cinnamon, worked on this with Francesca so she could elevate her writing. I also made sure she checked her facts before we published the article. Was that a squirrel we heard in the tree? Actually I heard Francesca laid down just after this photo was taken! I just wanted to show you proof that Francesca has joined the Wednesday Walkers volkswalk group. She does the 5K. I don't like the heat so don't go. I do think she spends more time recreating than learning how to blog, however! See... there is Francesca on the right. If you click on the photo you can see the whole group. One day on the way to the post office, we stopped in to a very interesting building. In the building were many dogs. Big dogs and little dogs. And, there were people too. We visited and then I was signed up for Day Care. It is a lot like pre-school. 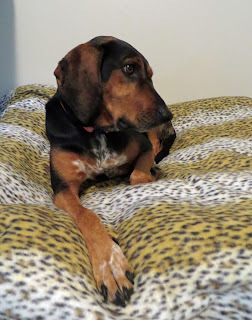 On my first day I was barely out of bed and Cinnamon's owner walked me several blocks to the building with the dogs. It is named "A Dogs' Best Friend." I went inside and they took me to the back room where I waited for the other dogs to get there. I was very excited as each one came in. I played and played. We had a lunch break and I got lunch and a nap. But I kept one eye open to watch the other dogs. In the afternoon it was hot so we got misted with water out in the play yard. I played and played. About 5:30 Cinnamon's owner came to get me. I got a treat in the lobby and then walked home with her. I was pretty tired. I think this is why they enrolled me in Day Care. Once I got home, Cinnamon was there to greet me at the door. We had some dinner and then lazed around most of the evening. Cinnamon said she got a good rest while I was at Day Care and wished I would go more often. So that is the story of my first day at Day Care. I can't wait to go back. Editor's Note: I've graded this essay as a C. That's a pretty good start. She got the high mark for correct spelling. I marked her down for lack of descriptive phrases and repetition. Also, I'll have to teach her to use big words like I, Cinnamon, do! 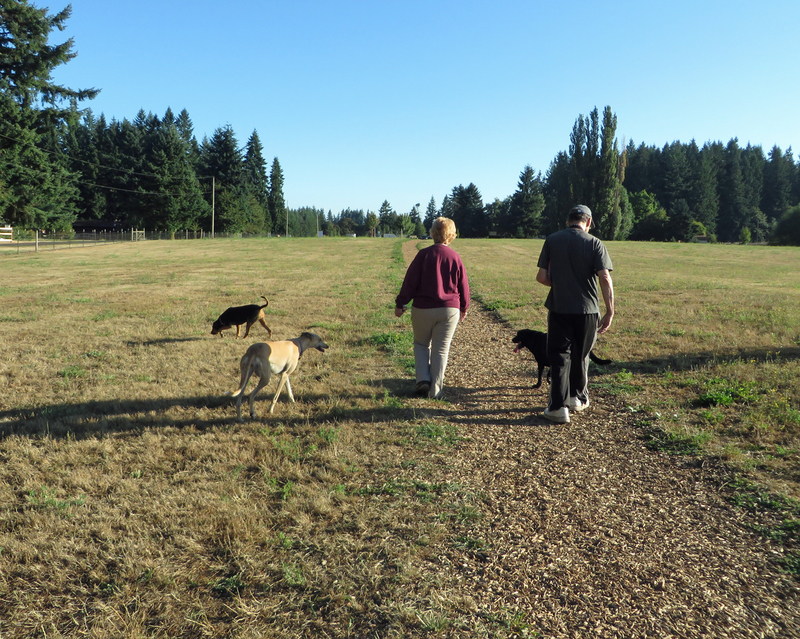 I am a great fan of our beautiful dog parks in Clark County and Vancouver, Washington. I go often (and even more often now that I have to put up with my intern, Francesca and her energy). We have a membership in support of the beautiful dog parks. It is only $25 per year. 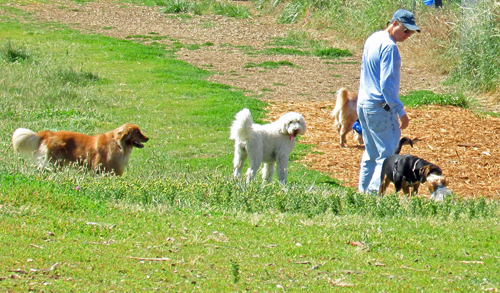 Today at the dog park while Francesca was romping around acting crazy, I was talking to some friends of mine. 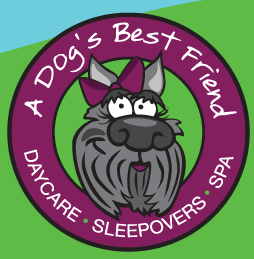 I heard that Clark DogPaw, the non-profit supporting the dog parks was worried about not having enough money. In fact, there was a sign there encouraging MORE MEMBERSHIPS. I would be really upset if I didn't have the choice of the five dog parks in the area. Washougal has to relocate so I don't know where that park will be. But I have one near my house. That is the Dakota Dog Park. And then, my favorite, but farther away, the Brush Prairie Dog Park, or Lucky Dog Park. The parks are well-maintained with volunteer help. The dog parks are one big reason I live in Vancouver. I can run free of a leash and know I'll be safe since they are fenced. Otherwise, I'd be stuck on the leash all the time. I've traveled through many states. When we travel, we stop at dog parks. What I found is that most of them are small and dusty. My dog parks here have grass and bark dust lined trails. Some have water stations. They are the best dog parks you'll ever want to see. So please.... support Clark DogPaw with a donation. And, if you use the parks, PLEASE BECOME A MEMBER. Clark DogPaw will appreciate your support. Here's one of the places you can donate. If you donate, tell them Cinnamon and her silly intern, Francesca sent you. WE LOVE OUR DOG PARKS! I haven't written much lately because I've been so busy with my new Intern, Francesca. She's been here a week now and IS NOT PULLING HER WEIGHT. She doesn't write anything and she doesn't show up to instruction sessions on blogging. She plays all day and thinks that's all she needs to do to earn her keep. 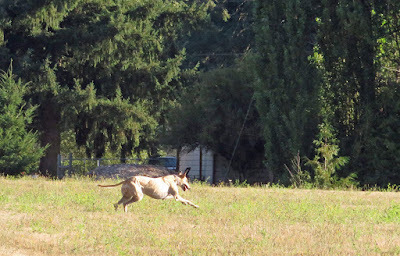 Oh yes, she chases squirrels (even when they aren't there). She spends plenty of time looking at the trees HOPING she will see one and then barking if the leaves move. Let me tell you, this has been an exasperating week! Here's what a typical day is like FOR ME! 6 a.m. Francesca wakes up and annoys me. I usually sleep in until 9 a.m. Well, not anymore! She thinks it's her job to wake me up and then wake up our owner. So sleepily, I go outside at 6 a.m. I sniff around and she hopes to find squirrels. 6:15 a.m. First breakfast: Francesca insists on an early breakfast stating she needs sustenance for her busy day. BUSY DAY, MY EYE... all she'll do is play! After a small breakfast she is SO ANNOYING we have to take her to the dog park, which opens at 7 a.m. (I have to admit, I like that part. I'm up for the dog park at any time... unless it's a hot day). 7 a.m. to 8 a.m: DOG PARK. While I trot around and sniff things and greet dogs and their owners gently, Francesca is running around like crazy making a fool out of herself. She tries to play with all the dogs, even the teeny ones. She also steals balls from dogs and hops around teasing them. I, of course, watch this from a distance, not wanting to be associated with her. Fortunately, now, Francesca has a new friend who will romp and play with her. Her new friend is about as silly as she is! They work hard at getting dusty. 8:30 a.m. Second Breakfast and nap time. Sometimes Francesca sleeps under my owners computer desk. She thinks she is learning about blogging this way. HOW CAN YOU LEARN IN YOUR SLEEP? Here's the other thing Francesca does... sleep! After that its play, nap, play nap. Notice there is no learning or writing going on? This continues until dinner time. After dinner we have a great time playing together outside. I've finished MY WORK and am in the mood to play tug of war and toys. I think I may have made a mistake to hire a young intern. So far she knows nothing about work ethic. ALL SHE KNOWS ABOUT IS PLAY ETHIC! Enough of this. She's asleep so I think I'll take a nap too! 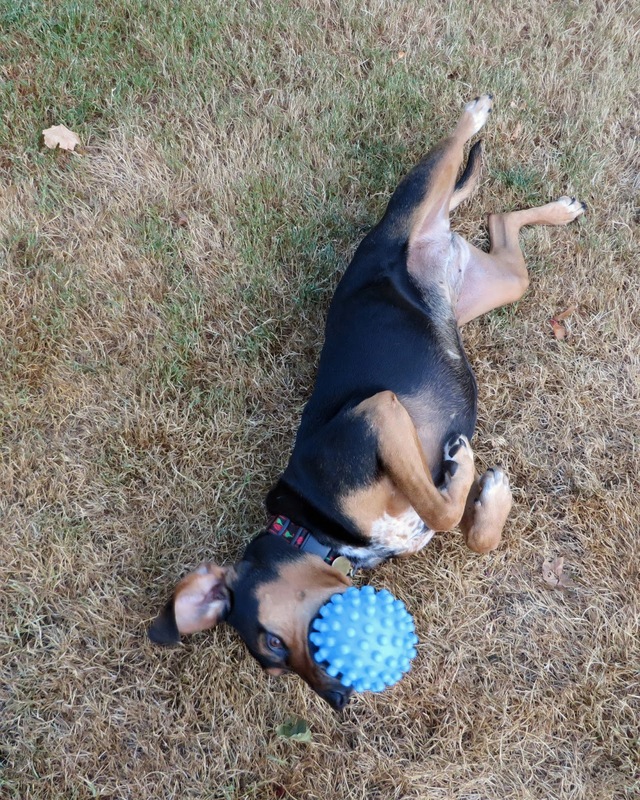 Each evening I participate in exercising "the new dog." I am working hard on tolerating her. She is working hard on bugging me! I haven't been writing too much lately because I have taken on a very time-consuming project. You see, I have taken on an intern. Interns are supposed to be young, energetic, motivated, up and coming professionals who are eager to learn from you. Since I am such a well-known blogger I get letters and emails all the time from students who want to be my intern. So, when my owner had cataract surgery I had time on my paws. I did some thinking. It was getting really boring around here and I thought my writing career needed a boost. So I started looking for an intern to mentor. 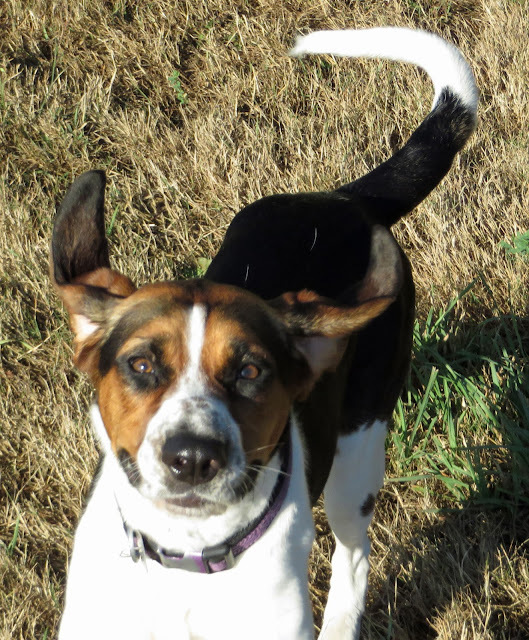 I looked at Southwest Washington Humane Society. I looked at the Oregon Humane Society and I just couldn't find the right dog for the job. 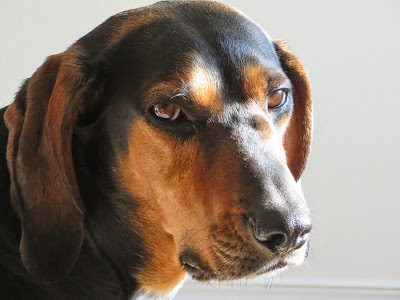 You see, it had to be a hound since my blog is all about Coonhounds and their stories. So for the past few weeks I eyed a picture of a dog down at the Yamhill County Humane Society. She was a hound and they said she was young and smart. But no one adopted her. 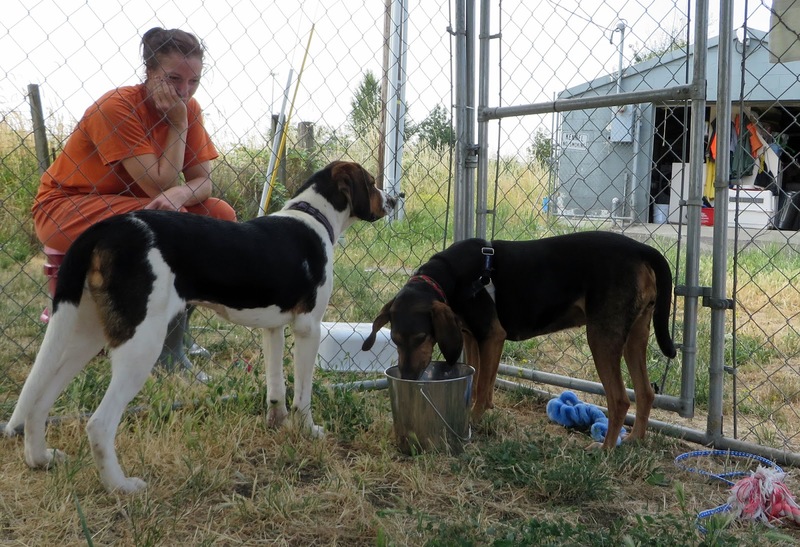 NOBODY IN YAMHILL COUNTY WANTED A COONHOUND for a pet or an intern. After the fireworks were over I decided that it was time to get serious about an intern. We called down to Yamhill County and found out the dog was still there.... languishing in her jail cell. (I won't say more about that as I am sure she would want to tell her story on her own). 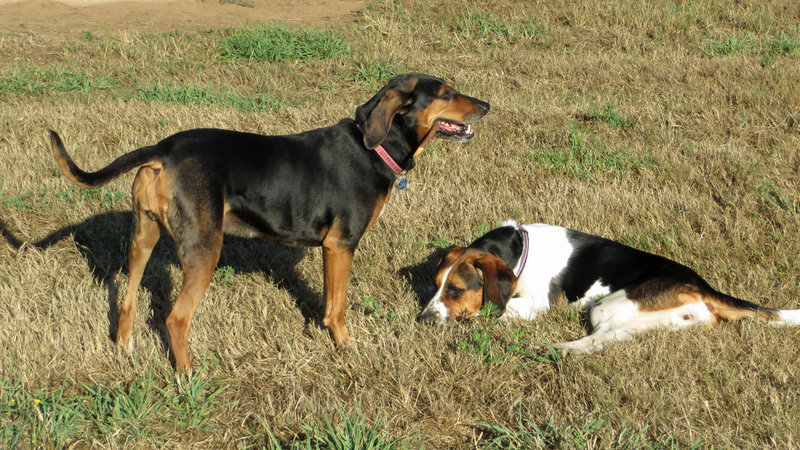 if owners aren't responsible for their dogs, they'll hunt them down! One beautiful day we headed for wine country. We didn't stop to taste wine and drove right through Dundee, Newberg and all the quaint towns. 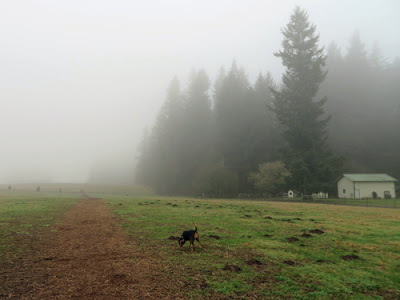 Our destination was the Yamhill County Dog Control office at the back of the Yamhill County Fairgrounds. It wasn't a very pretty place but I wanted an intern who would appreciate the education I could offer... and nice room and board, too. We arrived and went into the office. The officers there almost cheered when they found out I was there to visit "Frances" the coonhound that nobody wanted. They were so nice to me! We went walking with Frances and I interviewed her. She seemed smart enough. After spending time in "the pen" with her I told my owner we should take her home. I also said she needed a more impressive name... so Francesca it was! She promised to be good. She promised not to get in trouble again. She promised not to play with my toys or bother me when I was writing. 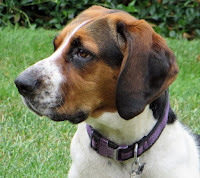 But most of all she said she was full of coonhound tales to share with my readers. She literally jumped into the back of the car when all the paperwork was done. She was ready to go! And I had no idea what was in store for me when we got back home. We both slept all the way home. Francesca and I have tons of tales to tell. Life won't be boring any more! the fine art of blogging! Let me introduce you to my intern, Francesca, who is about 2 years old. She is on probation here and I'll be keeping an eye on her to make sure she learns and behaves herself. If she's good, I'll even take her to the dog park! Meanwhile, I'd like to put in a plug for the folks down at Yamhill County Dog Control. They really care about animals there and even train dogs in hopes they will be adopted. 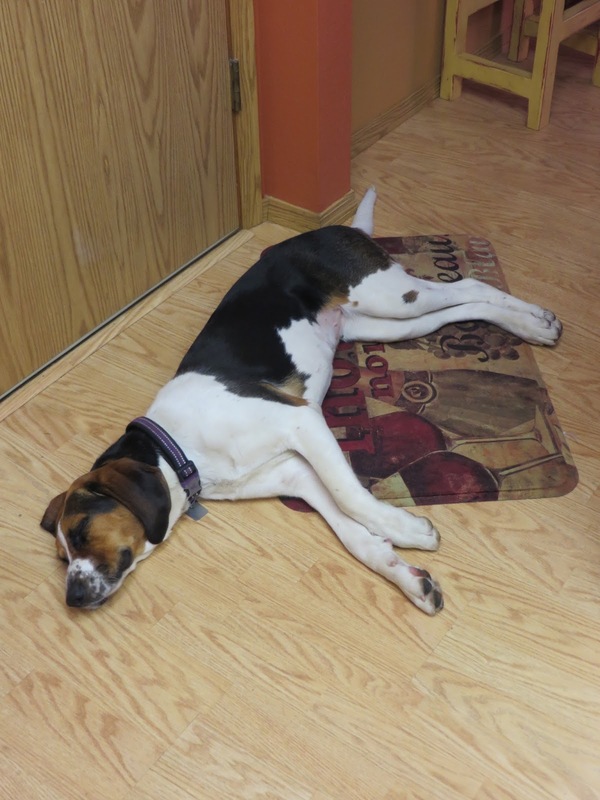 The animals they bring in get veterinary care, their shots and are spayed or neutered. They subsist on monies earned from dog license fees. They get no county money. Please consider sending them a few dollars to help dogs like my new intern. Here is their website. This has been a rough couple of weeks. 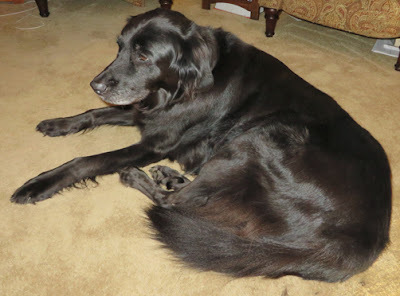 First the terrible fireworks and then the news that Country Cousin Remi headed over the Rainbow Bridge. Now Remi was 14 years old, but that doesn't make the news any easier. If I hadn't moved to Washington State I would have never met Remi. Now I have to admit our first meeting wasn't all that pleasant. He growled and barked at me. Imagine! But after we spent some time in the backyard and pasture together and got treats from Tom together we became pretty good friends. Remi was privileged because of his advanced age. He got to sleep in the master bedroom. 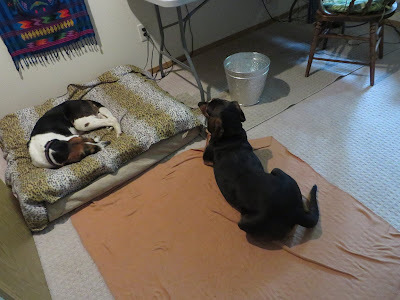 I had to sleep with Cousin Indy in the den when we visited. What I remember most about Remi was that he had a beautiful shiny coat. It was soft and pretty. 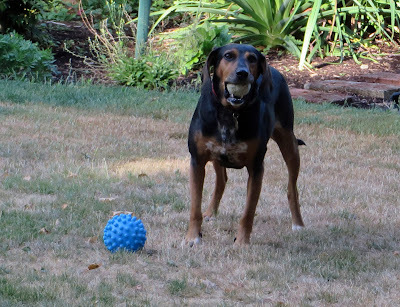 And, he tried to play balls with us in the pasture even though he was, well.... old. He had the spirit of a puppy. So I'll bet now that he's Over the Rainbow Bridge, he's running and chasing all those rainbow colored balls... and getting treats too! Well, look at this. The Columbian reported, this morning, that our City Council here in Vancouver, WA is going to explore a ban on fireworks. I am so happy about this! I am sure I'm not the only dog in town that was happy to see the front page of the paper today. Well, I suppose there are still dogs that get paddled with a paper for piddling in the house. But not me! If you have been reading my blog you have heard me agonize about the fireworks here in Vancouver and Clark County. I don't understand why people do it. Don't they care about us? Well, I'm so excited, I might just go take a walk. It's all quiet now in our war zone (formerly called my neighborhood). This will be the last entry for the 2015 "Season of Terror." Last night I heard just a few fireworks. Yes, they were illegal but people don't care. If they have them, they shoot them off. I trotted back to the bunker when I heard them but was very relieved that more didn't follow and slept ALL NIGHT on my regular cushy bed. I was rather proud of myself for relaxing enough to do that. So today we are dismantling the bunker and putting everything away. The great news is that we are going away FOR A WHOLE WEEK next July. I will not be home for the 2016 "Season of Terror." I am so glad! All I can say about last night is that it was SO BAD that I tried to melt myself into the quilts in my bunker. I wouldn't come out to go potty or to have a sip of water. I just stayed there until it was over.... somewhere around 2 a.m. It was SO BAD I don't want to talk any more about it. Here I am praying in my bunker. So what I really want to talk about is what the morning was like. It was so smokey last night my eyes hurt. But this morning it was beautiful and clear.... and quiet! I could hear the squirrels scampering on the fence and I got up and chased them away! I felt so good I wanted to play ball at 7 a.m. I felt so good I didn't need my bunker anymore. I just hope it doesn't start again tonight. That's illegal but people around here don't seem to care. I play keep away with two balls. The object of the game is to keep them both. It was still wet out this morning. We hosed down the yards and the eaves of the house. The fireworks were that bad. I romped and rolled and reveled in the sheer joy of the cool, QUIET, morning. The best thing about the 5th of July is that it's not the 4th of July! If I look a little tired. There is a reason. Well, last night was horrible. Evidently no one around here has a calendar. In Vancouver, WA where I live, fireworks are allowed on the 4th of July ONLY. Last night there were lots of fireworks going off and IT WAS NOT THE FOURTH. So today I sleepily wish you all a happy Independence Day. It's a holiday for humans. There is no freedom from fear for pets. I don't feel free all holed up in my bunker on a beautiful night. And tonight will be worse. We will close all the doors, windows and blinds. And we have to water down the yard so it doesn't catch on fire. My neighbor dog has to take a sedative to get through this. Neither of us will be celebrating at all. Neither of us feel a bit free. But you humans just go have your fun! Well, just remember that fireworks are illegal here except on the 4th of July and last night WAS NOT THE FOURTH OF JULY! So here's how things went down. It was a hot and quiet afternoon. I didn't do much except laze around wishing it would cool off. After dinner, I waited for the sun to go down. It was quiet. I thought that everyone was going to obey the law. So I got my harness on and we headed out the door. The evening was cool and quiet... UNTIL... Bang, Pop! Yikes! I turned right around and headed for the door. Once I got inside, my owner took my harness off and I high-tailed it for, you guessed it, my bunker. This time I was scared. I went in to my inner bunker, the one made just for the 4th of July. I got in, felt better and laid down hoping the fireworks would go away... FAR AWAY. But they didn't. So, like the City of Vancouver is asking us to do... we called 911 and said we were just calling to report illegal fireworks. The nice dispatcher lady took down the information about where the fireworks were. I told her I was Executive Director of Dogs Against Fireworks. She then said she'd be relaying the information to the Fire Marshall. (A dog in my position gets action... right away!). We thanked the dispatcher and I went back to settling into the bunker. I slept there all night and felt pretty good about my safe place. Well, I survived July 1st. I built my bunker and felt ready for whatever the neighborhood had in mind for me. I even took a walk after the sun set and it cooled off. I talked to some neighbors about fireworks (they plan to set them off on the 4th) and their little girl admitted she didn't like them. I'm with her! So when it was time to go to bed I heard fireworks in the distance. I was pretty tired by then so just walked into my safety zone where my travel bed was. That's the outer perimeter of my Fireworks Hiding Place. It's just outside the door of my bunker. This is the outer perimeter of my Fireworks Safety Zone. My bunker is built just to the left of where my travel bed is here. I flopped on my travel bed and went to sleep, listening to the rush of the air conditioner. I suppose the fact my owner sleeps in that room too helped... just a little bit. I slept through the fireworks and through the night. It was a good July 1st. OK, like I told you, one of the ways I am going to cope this 4th of July is to have my safe place all ready for me when I hear a Snap, Bang, Crackle, Boom! The first thing to know when building an Anti-Fireworks Bunker is to pay attention to your dog's behavior when scared. If the dog likes a particular closet, build the bunker there. If your dog likes their crate, have their crate in a protected place in the house. For me, I've decided that my safe place is the Master Bathroom. In particular, I like the shower stall. So I spent the afternoon building my bunker there. First I put a washcloth between the sliding glass doors so they wouldn't make any noise or shake when I went in there or when the fireworks went off. Next I got some really comfortable bedding to make it cozy and homey. Bedding also serves to absorb sound. Then I brought in some reading material. I figure the seige will take quite awhile on the 4th. I chose a book about Santa Fe, my home town, with lots of pictures. It will make me feel comfortable. Here's my favorite book and some toys to make it all homey. Then I brought in a couple of toys to make it just like home! Lastly, I put up a sign so my owner wouldn't mistakenly take a shower in there! Here's the sign so no one thinks this is a shower, now! All ready to go! If you make a bunker, please send me a picture so I can put it on the blog here. We all should share anti-fireworks ideas! I’m building my bunker, my safety zone, today. Last night I was happy lying on my regular bed in my regular room, the den when…. Snap, pop, boom! The first fireworks of the “holiday,” were set off, illegally. Legal or not, I am scared of fireworks. 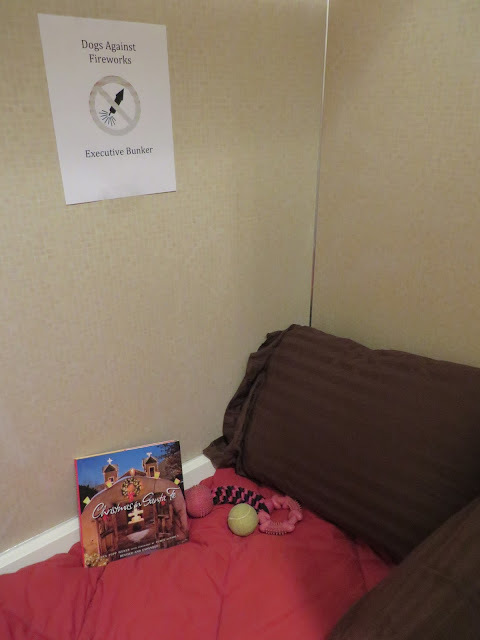 So I walked, calmly to my owners room where I have my designated safety zone. When I am scared, I head for the center of the house and look for a place with no windows. This is the same place that humans would seek if there was a tornado. I’m good at finding my safety zone. Friends of mine like the laundry room or under the stairs. My safety zone in this house is the master bathroom. No windows, in the center of the house and somewhat safe, I believe. 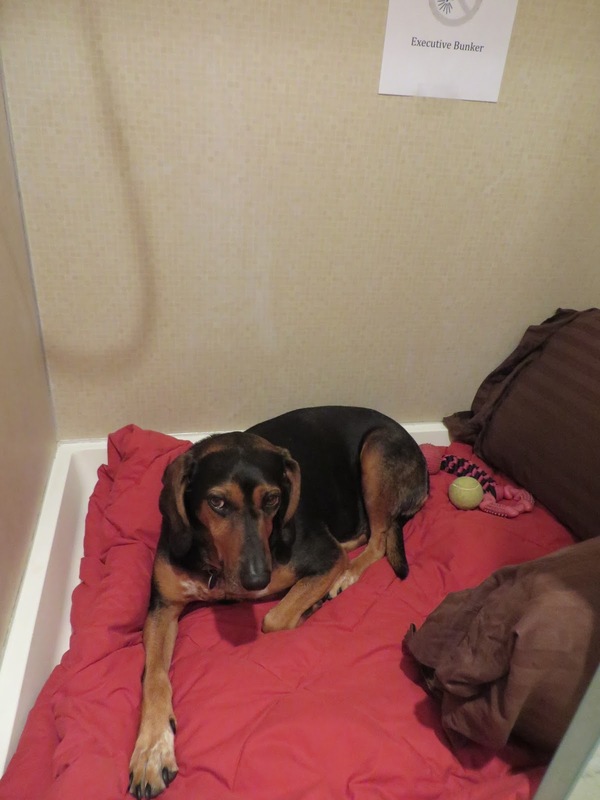 I hide in the back and, if it is open, I’ll crawl into the shower stall. So last night I was just a little bit scared so I sat on the bath mat. My owner saw me and got out my travel bed and put it in the vanity nook… about a foot from where I was hiding. Once the sound stopped, I decided the travel bed looked safe enough, so I slept there all night. Here I am in the center of the house. I have my travel bed set up. I'll also be building a safety bunker in the shower stall. That's to the left of this bed in the vanity area. Now I am fully aware, as Executive Director of Dogs Against Fireworks, that there will be more…. Louder, scarier and illegal fireworks to come. Today I am building my bunker. I’m getting prepared for one of the scariest days of the year. It’s a day when humans forget about us animals and go kinda crazy. It’s a day some animals get lost out of fear. It’s a day the rest of us get scared and try to hide. Is this fun? Some humans think so. So here are some tips for helping dogs get through the 4th of July horrors. Safety Zone: Build a safety bunker (I’ll be showing you mine very soon!) Any enclosed area without windows will work. Closets are good. 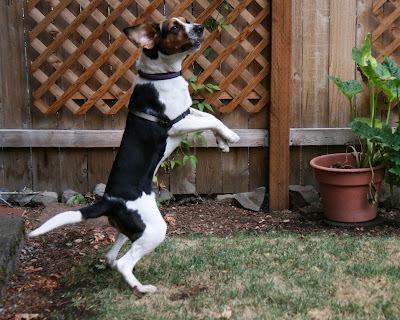 Exercise: When there are no fireworks, like in the morning, exercise your dogs outside and play. 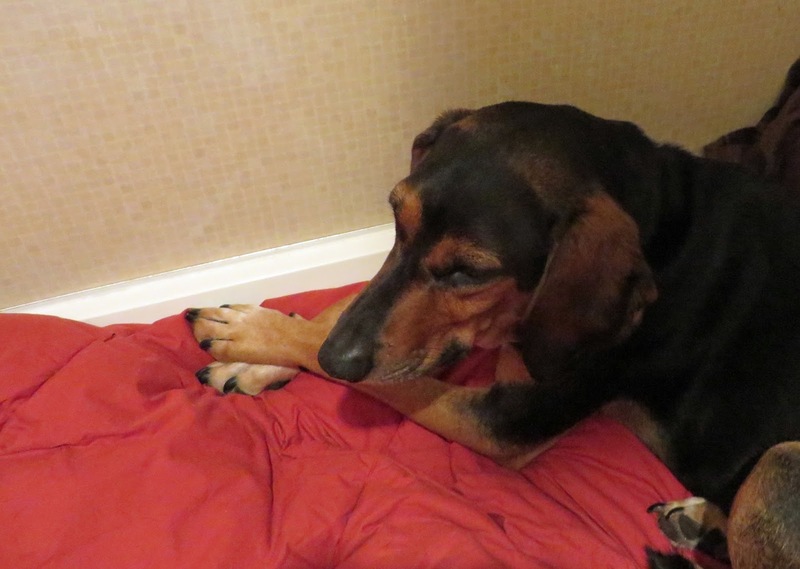 Stay Inside: Keep your dogs inside when there might be fireworks and keep them company when they are scared. Muffle Sound: Turn on the TV, or better yet, the A/C, to muffle the sound. Crate: If your dog likes his or her crate, make sure it is available to them during fireworks time. Windows: Keep windows covered and closed. 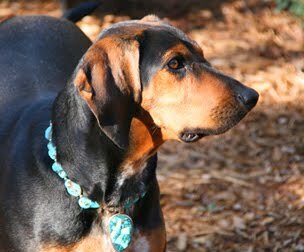 ID Your Dog: Make sure your dog, in case they run, has current tags and is micro-chipped. Thunder Shirts: If your dog feels more relaxed with a Thundershirt, have one on hand. Feeding: Feed your dog lighter meals during a time of fireworks. Medication: Try to avoid medicating your dog, but if you do, consult a good veterinarian to get a prescription or advice. Get Away: If you can, find a fireworks-free place to vacation… like a National Forest. I’ll be busy today building my bunker. But I’ll make sure I take photos to show you what a safety zone looks like! hiding in my owner's vanity nook. tuned for more information about how I am building my safety bunker!